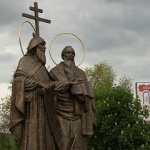 Saint Cyril and Methodius Day is observed by the Eastern Orthodox Church twice a year: on May 11 and 24. The most popular day for celebration is May 24. Saint Cyril and Methodius are venerated by the Orthodox and Roman Catholic Churches. These saints are regarded as the principle Christian missioners among the Slavic peoples. They influenced on the cultural development of all Slavs and introduced the first alphabet to transcribe Old Church Slavic, the first Slavic literary language. Religious feast day of Saint Cyril and Methodius is observed in many countries: Russia, Ukraine, Bulgaria, Belarus, Macedonia, Moldavia. But the feast has a status of a national holiday only in Bulgaria, Russia and Macedonia. May 24 is known in Bulgaria as Bulgarian Education and Culture and Slavonic Literature Day. This holiday celebrates Bulgarian literature, culture and alphabet. The Republic of Macedonia annually celebrates a national holiday of Saint Cyril and Methodius, Slavonic Enlighteners' Day. The holiday gained the status of a national day in October 2006. Russia annually celebrates Slavonic Literature and Culture Day on May 24. This holiday celebrates both alphabet and Slavonic literature.